The unelected official acting as head of the EU, Manual Barolo, has made the clearest statement yet in support of the UK's exit from the EU. As the Telegraph reports extensively, Senor Barolo has called on Cameron to honour Churchill's vision of a United States of Europe. Churchill's support for a union of European nations is established historical fact. As is his complete opposition to the UK being a member. He saw a merging in particular of France, Germany and Italy into one fractious, squabbling federation, with the UK standing on the outside as an equally powerful player as this Babelesque Empire. He thought it the best long-term solution to another bloody conflict in Europe - all of which in the past have been caused by either the Fritzes, the Kermits or the Luigis. In resurrecting Churchill's vision, Barolo has provided the strongest support yet from Brussels' unelected officials for the UK's new relationship with the continent. NB Just after having written this and looking at my blog roll I notice North has already blogged exactly the same thing. I'm going to let my piece stand as I penned it quite independently. It's just a shame there's not a hack left on the Telegraph able to undrstand the irony. Every mincing gay in Africa is guaranteed a place in Europe thanks to a new judgement from the carpet-chewing total insanity that is the European Court of Justice. Refugees from this AIDS ravaged continent who face prosecution for homosexuality in their own countries gain the right to asylum in any European country if they have to 'act straight' at home. As Der Spiegel reports, it is this 'hiding' of their sexuality that makes the case. Dear God. The spectacle of the immigration queue at Heathrow being filled by six-foot Zulus all doing appalling impressions of being camp clone queens to try to fool the immigration officers is a nightmare scenario that could have come straight out of vintage Tom Sharpe. So the Mayor of Toronto has admitted he smokes crack cocaine, but only does so when he's out of his skull on alcohol. That's reassuring. Were it otherwise you may have thought he lacked judgement. Well, that's how Benedict Brogan describes the shipbuilding decision in the Telegraph this morning. Con Coughlin continues the meme, writing "I am sure I am not alone in thinking we are paying too high a price for keeping a few querulous Scots on side". And around the place are some quite nakedly offensive anti-Caledonian comments that would never make it into print if they were about blacks or chinese. The decision to axe 2 RF is also commonly attributed to the need to keep the RRS intact and gets thrown in. Spluttering red-faced Blimps have come as close to calling the Scots porridge wogs as they dare. This is worrying. As a Localist I'm fully in favour of 'devo max' - that is, devolution of all government powers to Scotland except those that can only be exercised effectively at a national level, such as defence, foreign relations, air traffic control and the like. I'm also fully in favour of a similar devolution of power in England. But if Portsmouth and the Clyde are of equivalent capability and I had to choose between them, I'd pick the Clyde too. And for political reasons that are not just about the referendum, but to create and foster a shared dependency. England and Scotland are partners in the Union, despite our disparate size. Theirs is a proud and ancient Kingdom that honours us as partners and allies and has stood alongside us in battle for three hundred years. Remember that tomorrow the shipbuilding decision may be between the Clyde and Toulon. I think the UEA Climate Change charlatans may have had more effect on how statistical research is reported in the UK than anyone has realised. The debacle over the exposure of their manipulation of statistics has made even the BBC wary of reporting any statistical revelation without offering some covering doubt. So when the voice of the global corporates Chairman of the CBI declared that the EU was worth £30bn a year to the UK, most responsible news media also reported that the cost of EU membership to the UK economy had also been put at £100bn a year. No longer are they just parroting the words of the press releases with all their gushing certainty; they may not be scrutinising the science, but at least we now have Doubt. That's good. Nowhere was this more apparent yesterday than in the reporting of the economic effects of immigration. The Centre for Research and Analysis Migration had attached a press release to a complex report that claimed that immigration to the UK had produced a net economic benefit. As Tim Wigmore points out in the Telegraph this morning, up to a point, Lord Copper. What the report actually shows is that non-EEA immigrants actually cost the UK economy £104 billion. Sensibly, even the BBC reported a degree of uncertainty over the figures, and MigrationWatch was allowed to put the countervailing case. In fact, all the recent figures have just underlined the findings of a seminal Channel 4 / ippr report dating from 2007. I wrote about this in 2007, 2008 and 2009. So did the Speccie. "For every Pakistani sucking at the taxpayer's teats is an Indian paying those taxes. For every feckless Somali demanding housing and health care is a Chinese grafting sixty hours a week to pay for it. The left-leaning ippr carried out an important study in 2007 that identified why Labour's immigration policy had not raised per capita GDP in the UK one iota; half our immigrants are net contributors, adding to GDP and paying taxes and creating wealth, and half of them are net consumers, spending taxes and subtracting from national wealth. The key, of course, is knowing which half is which. And it's not based on skin colour. If the government is serious about optimising the planning of public services, it needs to disaggregate the immigrant population and find out which groups are profit centres and which are cost centres. No doubt it has been doing so quietly in the background, but it looks as if talking frankly about the results of this exercise in public would blow their political cover to smithereens. The best research so far available (prepared by the IPPR late last year for Channel 4’s Dispatches) makes for uneasy reading. Only 1 per cent of Polish immigrants claim income support, as opposed to 21 per cent of Turkish immigrants and 11 per cent of Pakistanis; only 8 per cent of Poles live in social housing, compared with 80 per cent of Somalis, and 41 per cent of Bangladeshis. And within national groups, as well as between them, things are complex. Tens of thousands of honest, hard working Nigerian health care workers keep the NHS working, on low wages for the most part, doing jobs the white underclass scorn. We'd be better off deporting our own chavs to Lagos than losing these Nigerians. But there are also tens of thousands of Nigerians engaged in petty fraud, feeding on British public services, on the take and on the make. We don't need them, don't want them and would be better off without them taking up accommodation and crowding out access to public services. But we need above all to distinguish between them." When I wrote this previously, it was under the shadow that any comment critical of immigration was liable to earn the tag 'racist'. Gordon Brown and his bigoted stupidity did more to demolish the demonising effect of accusations of racism than anything else; Gillian Duffy made him look like a big, stupid, sectarian Gorbals lump and lost him the election. So this too has changed. And there you have it. The Climate Change frauds from the UEA and Gordon Brown - unlikely heroes both, but both responsible for fairer and more transparent and honest public debate. Ahem. I think that Kokoschka is mine. Despite there being a 30 year statute of limitations In Germany for the return of 'looted' art works, potential owners are being urged to look at photos published later today of the hoard found at an apartment in Munich; "If people see photographs of listed works, it may prompt memories of things that belonged to their relatives". I can confirm now, and herewith stake my claim, to such memory. The work in question will be one by Oscar Kokoschka and I remember vividly how my great uncle Samuel described it as signed 'OK', which must have made it unique and easy to identify. Other businessmen in Berlin used to pay Uncle Samuel insurance premiums to prevent their warehouses catching fire, so he must have been very talented in that skill. Apparently one business owner was short of cash one month, and begged Samuel to accept a poor daub by an unknown artist as security. It was unfortunate that Uncle Samuel's ability to detect commercial fires failed him on that occasion - perhaps he had a head-cold - for the poor art lover's warehouse burned down completely. Samuel's only crime was to neglect to pay tax on the considerable 'legal' profit of his sausage factory, making Kosher 'Berliner' sausage for Berlin's Jewish community. Many in our family believe that when Mr Kennedy declared himself to be this type of sausage it was in tribute to Uncle Samuel. 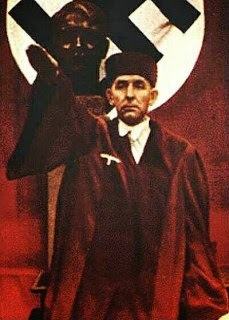 The Nazis seized his goods 'in lieu' of unpaid tax before he had a chance to smuggle them out. Samuel was left a refugee in England, Scotland and Portugal, with hardly anything left to his name except the house in Shepherd Market, the estate in Ullapool and the villa on the Algarve. After a misunderstanding as to his liability for income tax in the UK, Samuel spent a great deal of time in the Algarve, where he was great friends with a Mr Salazar. So when a photo is published later today of a Kokoschka signed 'OK' it's mine, OK? Will Margaret Beckett please turn the thermostat down! Now Beckett is further disadvantaged in that her entries are bare of the sort of additional information - charge periods, supplier details - that add verisimilitude to the claims of her colleagues. If I were the IPSA or one of Beckett's constituents I would want to drill further - by FOI or whatever - for details of these 'gas bills'. "Beckett was found to have claimed £600 for hanging baskets and pot plants by The Daily Telegraph in the 2009 parliamentary expenses scandal. As she had no mortgage or rent outstanding it was queried how she managed to claim £72,537 between 2004 and 2008 on a house in her constituency when she was renting out her London flat and living in a grace and favour flat". Of course she's no longer young and it may be that she simply forgets to turn the heating off when she leaves her 'duty' home. Either that or she's neglecting the PM's advice to 'switch' and is paying an over-greedy energy firm. Either way, it seems an outrageous waste of public money when so many hard working families can hardly afford to turn the gas on at all this Winter. Beckett clearly needs some expert intervention on the nation's behalf. ECHR to order Muslim bombers freed? As the Telegraph catalogues the government's frustration that a failed exploding Jihadist can appeal his conviction to the ECHR, I'm going to recycle a post from April 2011; repeating old polemic is something I've only ever done twice in five years, but I'm saddened that nothing has yet changed about the ECHR and I think this one is worth another spin. The ECHR remains a politicised circus of judicially unqualified clowns who have run riot with the contents of the dressing-up box. The ECHR is supposed to be Europe's supreme judicial authority on Human Rights matters, but the court has about as much judicial credibility as Roland Freisler's Third Reich 'people's court'. Freisler was the antithesis of judicial impartiality; a dyed-to-the-bone Nazi, he sent scores of the regime's opponents to the guillotine, including juveniles, after they had endured his bullying and ranting in court. Had a steel beam not crushed his skull like an eggshell during a fortuitous allied air-raid in 1945, Freisler would surely have faced the judges at Nuremberg himself. There's something hugely distasteful about a politicised judge. We appoint judges with great powers over our lives - powers not only to free or make captive, to punish or forgive, but also to take life. Even the European Convention on Human Rights, let alone the powers of our Parliament, recognises the legality of judicial murder in certain circumstances. In return for this power, we rightly demand that our most senior judges are superlatively legally capable, with deep experience gained in the exercise of justice before being appointed. And above all we demand the explicit assurance that they are absolutely politically neutral; that we will be not be disadvantaged by our beliefs should we kneel for judgement before them, but be judged purely on the rightness or wrongness of the case. None of the above applies to the 47 members of the ECHR. All of them are political appointees, put there by partisan politicians to promote a particular brand of social policy. Of the plenum, 20 are not even judicially qualified or experienced, but compliant dags, lapdog administrators, placed to bark at their political masters' commands. In this, it is no exaggeration to say that the ECHR is far closer in character to Freisler's 'People's Court' than to Britain's Supreme Court. 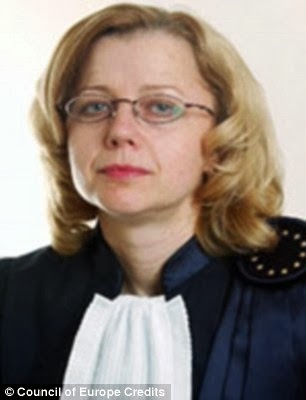 The ECHR is not a court but a circus, where the puffed-up buffoonery of the clowns, having run riot in the dressing-up box, deliver obiter of such blatent unjudiciousness that the spectacle would induce laughter were the 'court's' powers not so deeply enshrined in our Euro slavery. blogosphere like a syphilis bacterium, and it makes my flesh creep to imagine the evil behind those hooded eyes. Yet the ECHR circus used the excuse of this scoff-law's appeal to impose a political - yes political, not judicial - obligation upon our sovereign nation. Politics is not the business of a proper judiciary, but the life-blood of these clownishly-costumed popinjays. We must stand firm in rejecting this. There must be no compromise, no giving way. Thus and no further. This is far too important for any surrender. Here we must stand.